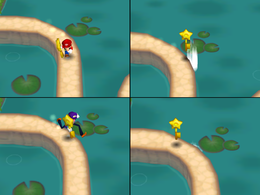 Unhappy Trails is an 8-player minigame in Mario Party 7. Its name is a pun on the phrase "happy trails". The objective of this minigame is to get a treasure at the end of the course. One player brings a key to their partner, who will then run to the treasure chest and unlock it to get a jewel. The player who opens the chest must bring the jewel to their teammate, who will then bring it back to the beginning of the path. The team that accomplishes this first wins. Rules – "Run a relay with your partner to find a precious jewel, then bring it back to the starting line." Advice – "The course is crooked and narrow in many places. Move carefully so you don't fall into the swamp." This page was last edited on April 13, 2019, at 18:40.